Police say the children were in a room by themselves when they found the gun and began playing with it. GRIFFIN, Ga. — Police say a 7-year-old boy was accidentally shot in the stomach, Monday, after the weapon fired while he and another child played with it. It happened at the Griffin Crossing Apartments in Griffin, Georgia. According to Police, officers, fire crews and EMS all responded to the complex around 4 p.m. where they found the 7-year-old. First responders airlifted him to the hospital to get treated. Meanwhile, after processing the scene, investigators determined that the 7-year-old was in a room with an 8-year-old when they found a .45 caliber handgun. The children picked it up to play with it, and that's when officers believe the firearm discharged. Officers initially said the children were home alone, but later clarified that they actually were left in the care of an adult. However, the adult was not in the room with the children at the time of the shooting. "At the time of the shooting, the adult was not in the room with them. The adult contacted 911," said Sgt. Chris Wilson with the Griffin Police Department. Wilson said investigators are now working with the Department of Family and Child Services on the case. Police said although no foul play is expected, the case is considered "open and ongoing," as Wilson said there were still other aspects of the case that will require further investigation. No charges are expected to be filed at this time. This is the second time within a week that authorities have responded to an accidental shooting involving children. Exactly one week ago, a Paulding County 6-year-old girl died after being accidentally shot by her 4-year-old brother. 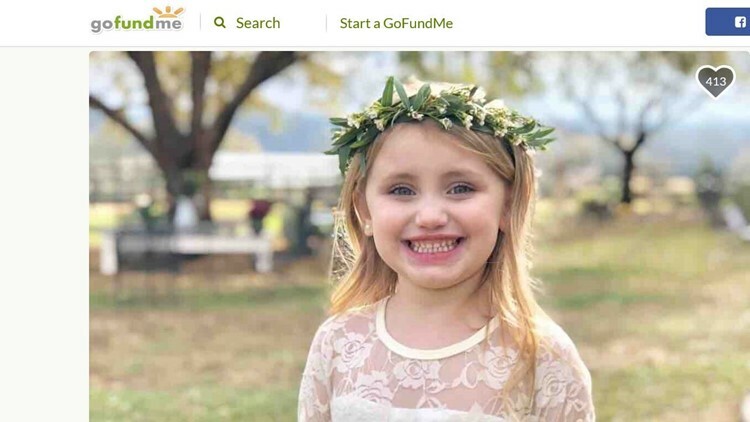 Millie Drew Kelly, 6, as seen in a GoFundMe account created for her family. Deputies with the sheriff's office said the children were in the car in the family's driveway when it happened. Authorities said the car wouldn't start, and when the mother got out of the car to see what was wrong, she heard a gunshot. Officials said the boy had somehow gotten hold of the gun from inside the car's console and fired it, hitting the girl in the head. No charges were filed in that case.